Using Census Bureau data, this report projects the share of Hispanic voters nationally and in battleground states for the upcoming 2012 election. Based on past trends, including growth in the adult Hispanic citizen population, we project that the Hispanic share of the nation's electorate will increase by 1.5 percentage points, from 7.4 percent in 2008 to 8.9 percent in the 2012 election. Also, we find that Hispanics will be a somewhat smaller share of voters in battleground states than of the overall electorate. However, there is significant variation in the Hispanic share across battleground states. We project that in November 2012 Hispanics will comprise 17.2 percent of the total U.S. population, 15 percent of adults, 11.2 percent of adult citizens, and 8.9 percent of actual voters. In 2012, non-Hispanic whites are expected to be 73.4 percent of the national vote and non-Hispanic blacks are expected to be 12.2 percent. To place the Hispanic share of the electorate into perspective, eight percentage points of the Hispanic vote nationally equals slightly less than one percentage point of the non-Hispanic white vote. The 8.9 percent Hispanic share of voters compares to veterans (12 percent of the electorate), those with family incomes above $100,000 (18 percent), seniors 65 and older (19 percent), married persons (60 percent), and those who live in owner-occupied housing (80 percent). In terms of voter turnout, we project that 52.7 percent (± 0.6) of eligible Hispanics will vote in the upcoming election, an increase from 49.9 percent in 2008 and a continuation of the past decade's long upward trend. The projected Hispanic voter participation rate of 52.7 percent compares to 66.1 percent for non-Hispanic whites and 65.2 percent for non-Hispanic blacks in 2008. In the four states listed by Cook as "leaning" toward one party or the other, the Hispanic vote will average 2.8 percent of the electorate in November. The four leaning states are Michigan, Pennsylvania, Wisconsin, and North Carolina. In the seven states Cook identifies as "likely" for one party or the other, Hispanics will average 9.8 percent of the vote. Excluding New Mexico, they will average 4.4 percent of voters in the remaining six "likely" states. The likely states are Arizona, Georgia, Indiana, Missouri, Maine, Minnesota, and New Mexico. Taken together Hispanics will average 7.6 percent of the electorate in the "toss-up", "leaning", and "likely" states. If we combine the populations of these states and calculate the Hispanic share of the electorate, Hispanics are projected to be 6.6 percent of the vote. The Hispanic share of voters varies significantly in the 18 battleground states. In 12 of the 18 states, Hispanics are projected to be less than 4 percent of the electorate (Virginia, Iowa, New Hampshire, Ohio, Pennsylvania, North Carolina, Wisconsin, Michigan, Indiana, Minnesota, Missouri, and Maine). But in four of the states (New Mexico, Florida, Nevada, and Arizona), Hispanics will be more than 16 percent of the vote. Non-Hispanic whites are projected to be slightly overrepresented (79.4 percent) in battleground states relative to their share of the national electorate. Like Hispanics, non-Hispanic blacks (9.4 percent) tend to be slightly underrepresented in battleground states. An enormous amount of media attention has been focused on Hispanic voters in 2012. Some commentators argue Hispanics will decide the upcoming election. Of course, we will have to wait until after the election to determine if this is correct. We can say that two factors will determine the impact of the Hispanic vote. The first is the share of the electorate that is Hispanic. The second is their partisan split. The purpose of this analysis is to use demographic trends and past patterns to at least answer the first part of this question and thereby better inform the discussion about the Hispanic vote in the upcoming election. We project that Hispanics will be slightly less than 9 percent of the electorate nationally in 2012. In battleground states, we project they will comprise 8 percent of voters. The Hispanic share of the vote nationally and in battleground states may seem small, but the upcoming election is almost certainly going to be close and even small changes in support may determine the winner of a particular state. Of course, this logic applies to other voting blocs as well. For example, nationally if a candidate increased his share of the Hispanic vote by 5 percentage points, but in doing so lost 0.7 percentage points of the white vote, the candidate would be worse off. Small changes in many different groups can decide elections. To give just a few examples, in 2008 7 percent of the electorate were high school dropouts, 10 percent were in families with incomes under $30,000, 12 percent were veterans, 18 percent had family income above $100,000, 19 percent were over age 65, and 20 percent were renters. A small change in how any of these groups vote could make the difference in a state. There are an enormous number of potential voting blocs, all of which overlap and all of which could be seen as deciding a close election. It would be a gross oversimplification to think of the electorate one-dimensionally. Religion, education, income, gender, occupation, marital status, age, and other factors have all been shown to influence voting decisions. Ethnicity is one of many factors that may impact the outcome of the 2012 presidential election. And it is not at all clear that ethnicity is the most important. To project the Hispanic share of the adult population and adult citizen population in 2012 we use data from the May Current Population Survey (CPS) from prior election years and 2012. The CPS is collected monthly by the Census Bureau and is one of the nation's primary sources of demographic information. We compare the May CPS to the November CPS Voting and Registration Supplement from prior election years. (The November supplement is collected by the Census Bureau every two years when there is a national election and asks a series of questions about voting and registration.) We then project the Hispanic share of the overall adult population and their share of the adult citizen populations from May 2012 to November 2012 based on growth from May to November in prior election years. That is, we average the Hispanic growth between May and November for 2006, 2008, and 2010 and apply this growth to the May 2012 data to generate our November 2012 projection for Hispanic adults and citizens shown in Figure 2. 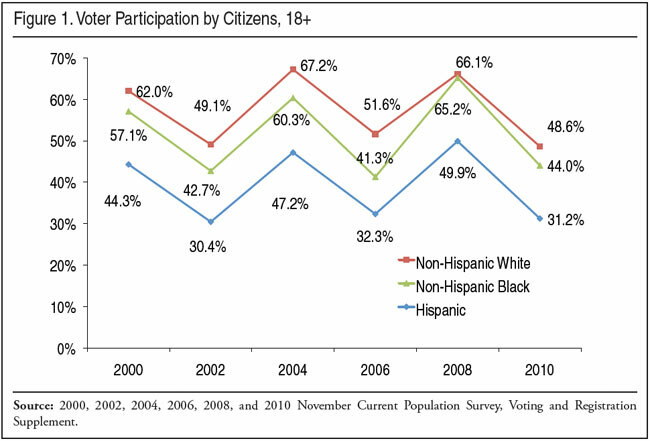 Figure 1 reports the share of Hispanic citizens ages 18 and older who voted in the last six elections based on the Voting and Registration Supplement of the Current Population Survey. The figure shows a modest increase in the share of eligible Hispanics who voted in presidential elections over the last decade. But there is no clear upward trend in off-year elections. Figure 1 also shows that although the share of eligible Hispanics who voted has been increasing, it was still substantially lower than the percentage of non-Hispanic whites and blacks. In terms of voter turnout in 2012, we project that 52.7 percent (± 0.6) of eligible Hispanic voters will vote in the upcoming presidential election given demographic and other trends. This projected Hispanic voter participation rate of 52.7 percent compares to 66.1 percent for non-Hispanic whites and 65.2 percent for non-Hispanic blacks in the 2008 presidential election. The extent to which Hispanics differ from that 52.7 percent participation rate may be an indication of how energized they are in 2012. While turnout among eligible Hispanic voters is much lower than that of other groups, Hispanics who are registered are only somewhat less likely to vote than registered non-Hispanics. In the 2008 presidential election 84 percent of registered Hispanics voted, compared to 90.2 percent of registered non-Hispanics — a 6.2 percentage-point gap. The big difference between Hispanics and other groups is in the share who register. In 2008, 59.4 percent of adult Hispanic citizens reported they were registered to vote, compared to 72.2 percent for non-Hispanic adult citizens — a 12.8 percentage-point gap. 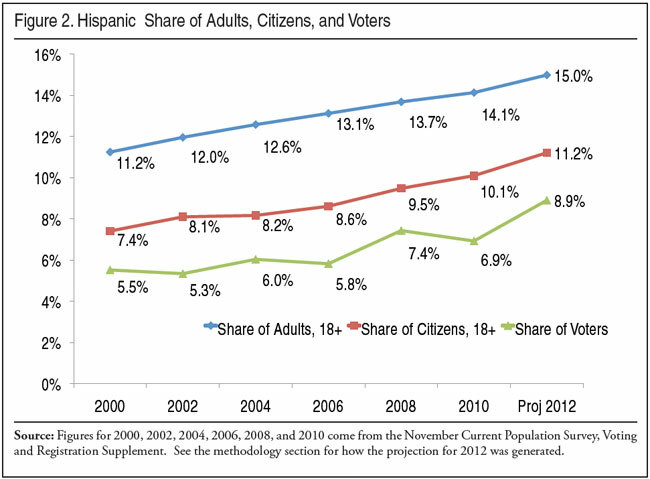 Figure 2 shows the share of the total adult population that is Hispanic, the share of adult citizens who are Hispanic, and the share of voters who are Hispanic from 2000 to 2010 based on Census Bureau data. Figure 2 also projects these same figures for the 2012 election. We project that Hispanics will comprise 8.9 percent of the electorate in November 2012. This is an increase from 7.4 percent in the 2008 presidential election and from 6.9 percent in the last off-year election in 2010. This very large difference between the Hispanic share of the adult population and their share of voters reflects several factors. Figure 2 shows that Hispanics are projected to be 15 percent of adults and 11.2 percent of adult citizens this November. But as we have seen, Hispanics are less likely to register and vote than are non-Hispanics. Moreover, Hispanic adults are less likely to be citizens. In May 2012, 31.9 percent of Hispanic adults were not U.S. citizens, compared to 1.9 percent of non-Hispanic whites and 4.8 percent of non-Hispanic blacks. Finally, Hispanics are less likely to be adults than other groups. As a result, Hispanics are a much smaller share of voters than they are of the overall adult population. In fact, in November the Hispanic share of the vote (8.9 percent) will likely be only about half of their 17.2 percent of the total U.S. population. In 2012, non-Hispanic whites are expected to be 73.4 percent of the national vote and non-Hispanic blacks are expected to be 12.2 percent. Our projections are based on past trends among both Hispanics and non-Hispanics. According to the Cook Political Report, the 2012 electoral vote scorecard as of July 2012 lists seven states as "toss-up" states. Those states include Colorado, Florida, Iowa, Nevada, New Hampshire, Ohio, and Virginia. Four states are characterized as "leaning" toward one party or another and an additional seven as "likely" Republican or Democrat. Leaning states are Michigan (D), Pennsylvania (D), Wisconsin (D), and North Carolina (R). The likely states are Maine (D), Minnesota (D), New Mexico (D), Arizona (R), Georgia (R), Indiana (R), and Missouri (R).4 These 18 battleground states total 213 electoral votes and will play a key role in determining the outcome of the presidential election in November. The analysis that follows relies on Cook's formulation. 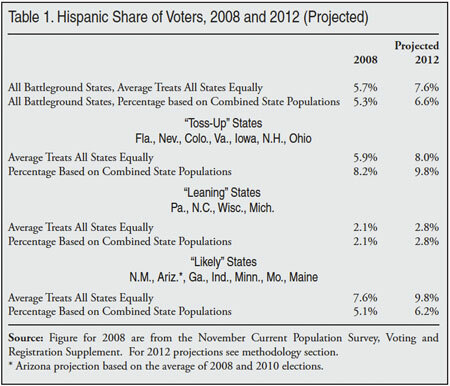 Table 1 shows the Hispanic share of voters in 2008 and projects their share of voters in 2012 based on past presidential elections and current trends in the battleground states. In many of these states the Hispanic share is small, so we do not report figures for the states individually. In the discussion below we focus on the aggregate results for the three types of battleground states and for all 18 states together. We project that Hispanic voters will average 8.0 percent of votes in the "toss-up" states in November 2012. In the states Cook defines as "leaning" toward one party or the other, Hispanics will average 2.8 percent of the electorate. In the states Cook identifies as "likely" for one party or the other, Hispanics will average 9.8 percent of the electorate (excluding New Mexico takes the average to 4.4 percent of voters). If we combine all of the 18 battleground states, Hispanics are projected to average 7.6 percent of the electorate in the upcoming presidential election. This is somewhat less than their share nationally. The above averages treat each state equally. If we combine the populations of the battleground states and calculate the Hispanic share of the electorate, Hispanics are projected to be 6.6 percent of the vote. Table 1 reports the combined or "weighted" averages for "toss-up", "leaning", and "likely" states. Taking into account population size may be a better way to think about these states because the Electoral College is based on population size. On the other hand, each state represents an individual race. Therefore, averaging percentages across states could still be seen as a better approach. Based on prior voting trends and recent data collected by the Census Bureau, we project that Hispanics will comprise 8.9 percent of the national electorate in the 2012 presidential election. We also project that Hispanics will be somewhat underrepresented in battleground states. They will average 7.6 percent of the population across battleground states, or 6.6 percent if we combine the populations of these states and calculate the Hispanic share of the electorate. Although they comprise a small share of the electorate, they are still an important part of the vote. And their vote may well determine the outcome of the election. Of course, in a close election the same can be said of almost any group. The 12 percent of the electorate comprised of veterans, the 18 percent with family incomes above 100,000, the 19 percent over age 65, and the 60 percent who are married will all have a larger impact on the election than Hispanics. The American electorate is comprised of numerous overlapping voting blocs. It would be a mistake to think of the electorate only in terms of race or ethnicity. Many factors influence voting decisions, including religion, education, income, gender, occupation, marital status, and age. There is also ideology and voters' perception of candidates' character and "likeability". As the campaign unfolds it would be wise to remember the complexity and multifaceted nature of the American electorate and not over-emphasize ethnic identity. 1 The Cook Political Report, July 2, 2012. 2 Because of anomalies in the data, we use both the 2008 and 2010 November CPS as the basis for the 2012 projection in Arizona. 3 In 2010, the Center for Immigration Studies projected that Hispanics would comprise 6.8 percent of the national electorate in the upcoming election in November. When the Census Bureau released the November 2010 CPS it showed that Hispanics were 6.9 percent of the electorate. See "The Hispanic Vote in the Upcoming 2010". 4 The Cook Political Report, July 2, 2012.